Penniless Olvus is an Imperial commoner living the hard life as a beggar in Anvil. His bedroll and food sack can be found on the east side of the Main Gate. 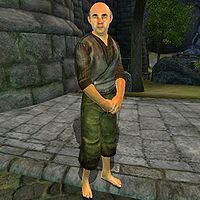 Olvus lives the typical life of any other beggar in Cyrodiil; He starts the day at 6am and positions himself near the Main Gate for four hours of begging. He retires to his bedroll at midday and stays there until 2pm, when he takes the short walk to the Chapel of Dibella and resumes his begging routine for the next four hours. At 6pm he returns to his bedroll, picks up some food from his sack and enjoys it for two hours. Once he has eaten, he spends the rest of the evening in the same area, just drifting around. Due to a bug, Olvus unfortunately never sleeps, but spends the entire night standing next to his bedroll, until he heads back to the Main Gate at 6am. His schedule suffers some changes during the rainy days, when he will instead seek shelter under the roof of Morvayn's Peacemakers until the rain ceases. Also, if you have installed the Knights of the Nine official plug-in a new schedule will take precedence, when he will instead decide to listen to the Prophet's rantings from 10am and until 8pm, regardless of weather. His wardrobe certainly reflects his social status, consisting of only a coarse linen shirt combined with sack cloth pants. He carries with him his cup and any amount of gold he collected during the day. As a beggar his combat resources are limited, relying solely on his fists when attacked. Olvus is infected with the brown rot disease, and you may catch it from him during combat. He is one of the few people that can tell you how you may join the Thieves Guild, and will also provide you with some information during your jobs for the Guild. Also, he is one of the "poor and suffering" whom you need to speak with in order to receive training from Tandilwe. Finding the Thieves Guild: So you want to join the Thieves Guild? Don't you know it doesn't even exist? Taking Care of Lex: Get Hieronymus Lex reassigned. Speechcraft Training: Cyrodiil's master orator wants you to comfort the unfortunate to prove yourself worthy of her training. Olvus has a sleeping package that should make him sleep from 10pm to 6am, however instead of being set as a Sleeping type of package it is instead set to a Travel type. This means that Olvus will simply travel to his bedroll assuming he's not already there, but once he arrives he will simply stroll around the area. This page was last modified on 20 May 2018, at 06:39.